Our next DietBB Seminar Series Talk with Dr. Gunter Kuhnle, Food and Nutritional Sciences, Universitiy of Reading, UK. There is an urgency to improve our understanding of blood-based metabolic determinants of cognitive function and discover new, independent predictors of cognition and future dementia. December 01, 2016 - DietBB BAEN Café "DNA – analysis and personalised nutrition"
Our next expert's conversation on the subject takes place at the Nees Bar Café Restaurant on the 1st of December 2016, 14:00. October 10, 2016 - DietBB Seminar Series: How do research results reach the mass media? The results of the nutrition research are a firm component of the daily news diet of the mass media. How usefull is this news food, however, for the public? Symposium on Nutrition and Microbiota in Bonn on June 22nd, 2016. 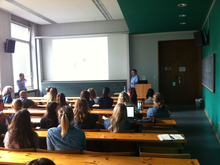 Prof. Dr. Hubert Preißl, Institute for Medical Psychology and Behavioural Neurobiology from the University Tübingen talked about the brain insulin sensitivity over the lifespan. Dr. Alexander Markowetz, scientist and author of the book "The Digital Burnout", talked about the relationship between IT, nutrition and medical sciences. May 03, 2016 - DietBB BAEN Café "Why do we eat what we eat: Food choice - a complex behaviour"
April 18, 2016 - DietBB Seminar Series: "Personalised nutrition: a route to bigger public health benefit?"